Part 1: A case for African textiles	Who, exactly, is “the media”? The previous article in the Transforming Africa [first published in African trader magazine] series presented the case for a continent-wide textiles industry in Africa, created by Africans for African markets. The article hypothesised the establishment of a knitting, dyeing and finishing plant to achieve that. In this instalment, Brian Bakker and business analyst Andrew McLachlan consider the entire cotton value chain, with particular reference to the supply of raw cotton to the plant. Can Africa spin its own cotton? The reason why a textile knitting, dyeing and finishing plant serving Africa first, and the rest of the world second, could not currently succeed is because the vast majority of cotton in Africa today is grown under contract for overseas markets. What it means is that Africa would have to dramatically expand its cotton production and avail itself of ginning and spinning facilities in order to produce enough spun cotton to supply such a hypothetical textile finishing plant. That’s a big task, given that Africa’s contribution to the cultivation of cotton has decreased considerably over the last five years. However, expanding the cotton-growing sector could help Africa to deal with its single biggest challenge today: Massive unemployment. This is because agriculture is a labour-intensive pursuit and if the structures can be put in place to support millions of small cotton farmers, rather than large industrial operations, African governments could reduce unemployment and encourage entrepreneurial development at the same time. In addition, there are potentially a number of spin-offs from the cotton growing and processing industry that can further impact on African economies. For instance, the primary waste product of the cotton ginning process is seeds. Depending on quality, a portion of this waste can be recycled for re-planting, another portion can be used to create cotton-seed oil, with the rest assembled into cakes for feeding livestock. All these ancillary pursuits offer opportunities for creating employment and contributing to the economy. The main factor cited for the recent decline in the production of cotton in Africa is the drop in global prices for cotton. Cotton production has nearly halved over the last five years, according to Bachir Diop, President of the African Cotton Association (ACA). Speaking during the ACA’s annual congress in Yaoundé, Cameroon, Diop also targeted soaring costs of agricultural inputs as a cause for African farmers abandoning cotton production and called for a “Marshall Plan” to save the cotton farming industry in Africa. The organisation estimates that the industry supports in the region of 25 million Africans for some or much of their income. Another part of the problem is that African cotton-producing countries have, for the most part, not concerned themselves with the cotton fibre value chain or looked beyond their place in it with a view to business growth. It’s high time that this attitude changed. First, however, it is instructive to consider the components of the value chain: Cultivation and ginning, which is the process of separating cotton fibre from the seeds, stalks and other impurities, typically have taken place on African soil. From there, the ginned cotton fibre has been compressed into standard 218 kg bales of cotton lint and exported, primarily to the Far East. The cotton is then spun into yarn, which is knitted or woven into fabric for dyeing and finishing. The finished textiles are shipped to garment finishing houses all around the globe but, again, mainly in the Far East. Already, Asian companies are investing in Africa to increase production of cotton, specifically. For example, Olam Mozambique – a subsidiary of Singapore-based Olam International – announced in August 2010 that an investment of US$6 million would be made in a new state-of-the-art cotton ginning factory and a further US$4 million would be invested in agricultural inputs. The total project is expected to eventually support up to 75 000 peasant farmers in the area. Similarly, across in Angola, a cotton processing factory with the capacity to process 200 tons of cotton per day was inaugurated in Kwanza Sul province in November 2010. This project is the result of a partnership between Spain’s Africa Sementes and Angola’s Mundo Verde and will not only establish cotton processing capability in the area but will also support the revitalisation of the cotton agriculture sector over an area of 5 000 hectares. Furthermore, in May 2010 The Financial Express of Bangladesh reported that as a result of a ban on the export of raw cotton from India to Bangladesh, the government intended to source cotton from African countries in future. Commerce Minister Faruk Khan suggested that stumbling blocks, such as excessive lead times from Africa, could be overcome with the assistance of the Bangladeshi government. He added that establishing Africa as the key source for Bangladeshi cotton spinning companies would create numerous investment opportunities on the African continent. There is, as ever, a problem with this scenario. The current modus operandi of Asian textile plants is to leave the cotton bales in bonded warehouses until such time as their spinning factories require them. This maximises Asian cash flow at the cost of Africans, who don’t get paid for their cotton until it leaves the bonded warehouse – a process over which they have absolutely no control. Furthermore, when dealing with African cotton suppliers, Asian companies typically work on a four-month lead time from order to availability in the bonded warehouse. That is partly due to the length of time ships take to travel from Africa to Asia, which is usually six to eight weeks, but the other two months are usually the result of inadequate infrastructure and complex trade relationships within Africa itself. This is something that African governments could address. obtained no local return on investment. A case in point was establishment of the Malaysian-owned Ramatex Textile and Garment factory on the outskirts of Windhoek in Namibia. The complex comprised four garment factories, two knitting factories, two spinning mills and two dyeing factories – in short short, a fully-integrated textile value chain using African-ginned cotton and turning out African-produced garments. According to various sources, the employment opportunities were to have huge implications for the Namibian economy: It was expected that 10 000 to 15 000 jobs would be created once the complex was fully up and running; initially, around 3 000 people were employed. The Namibian government established a team of stakeholders to manage the negotiations to ensure that Namibia won the right to host the Ramatex complex. It successfully beat several other African countries and invested some 60 million Namibian dollars to prepare the site for the Malaysians while also establishing an Export Processing Zone for the factory. Government also provided services such as power and water at reduced rates to further ensure competitiveness. Fibre Arrangement (MFA) on global textiles in 2005, Ramatex became even less co-operative with Namibian authorities, until the factory was closed in March 2008. It is clear that Africa needs to move up the value chain if its people are to benefit from any investment – domestic or foreign. A look at cotton production and export statistics may be instructive in this regard. Major cotton producers in Africa export roughly 90% of all cotton grown on the continent, with Nigeria the only listed country that retains 50% of its harvest for local markets. Overall, Africa produced 5.5 million bales of cotton in 2005 and this decreased to 3.55 million bales in 2009. In addition, 92% of production in 2005 was exported while only 89% was shipped out two years ago. The only notable local importer of cotton fibre in sub-Saharan Africa is South Africa, which acquired 155 000 bales (less than 5% of Africa’s output) in 2009. Egypt, Morocco and Tunisia are among countries on the rest of the continent that have established textile industries. However, as is revealed in United Nations Environment Programme (UNEP) research, there is plenty of unused arable land in Africa on which cash crops – like cotton – could be grown. Indeed, Hugo Ahlenius reports on the UNEP website that there are some 300 million hectares of unused arable land on the continent. 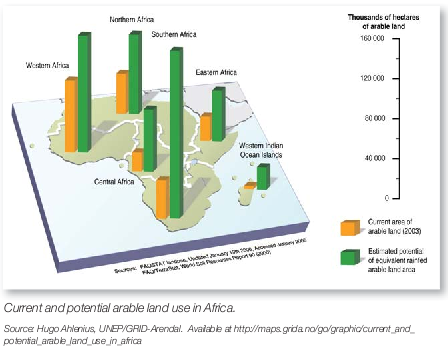 This could mean a potential increase in arable land used in Africa of anything from 150% to 700% per region, according the report, Current and potential arable land use in Africa. To put this into perspective, consider that the size of the whole continent is 30 million sq km. Since there are 100 hectares in one square kilometre, the estimated 300 million hectares represents a mere 10% of the total area of the continent. So we have the land, we have the people. Is there enough demand for cotton and cotton products? Global trends indicate that, if anything, demand for African cotton will continue to increase and it behoves leadership on the continent to ensure that this trade helps Africa and her people as much as it benefits foreign investors. As has been illustrated, this ongoing demand is a double-edged sword because it is likely to perpetuate the cycle of exporting raw cotton rather than processing it for local markets. This results in Africa having to import spun yarn, knitted fabric, finished fabric and made-up garments at huge premiums. The only way that Africa can break that cycle is by creating a home-grown industry to service Africa, thereby reducing its reliance on imports and perhaps eventually even turning the continent into a net exporter of fabric and garments. The first step is the hypothesised textile knitting, dyeing and finishing plant. The second step is to establish a number of cotton spinning mills. 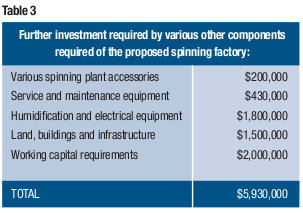 For a spinning facility capable of producing the daily output specified in Table 1, the investment in specialist spinning machinery alone might be in excess of US$10 million (see Table 2). In addition, other more general machinery would be required (see Table 3). 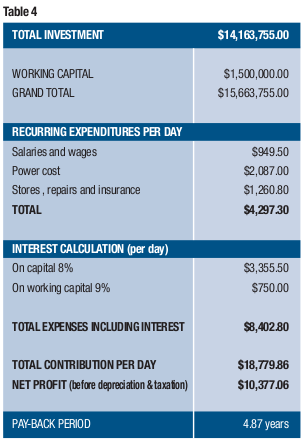 The anticipated running costs of such a plant are considerable, as detailed in Table 4, but according to these calculations, it should be possible to achieve a full return on investment in less than five years. From the calculations it is clear that the suggested venture would indeed be worthwhile in sub-Saharan Africa. Certainly, local clothing retailers would welcome the massive reduction in lead time from garment order to delivery. Currently, this is in excess of 150 days and if it were all done locally, it should be possible to get this to below 45 days – with a commensurate positive impact on cash flow. being a supplier of raw materials and importer of finished goods, and moved up the textiles value chain – in many other industries, too. Sakhile Ngcobo, Head of External and Corporate Affairs at De Beers Consolidated Mines, told the annual conference of South Africa’s Black Management Forum last year, “Africa has all that it needs to stand on its own feet.” Ke nako (it is time) it did so.